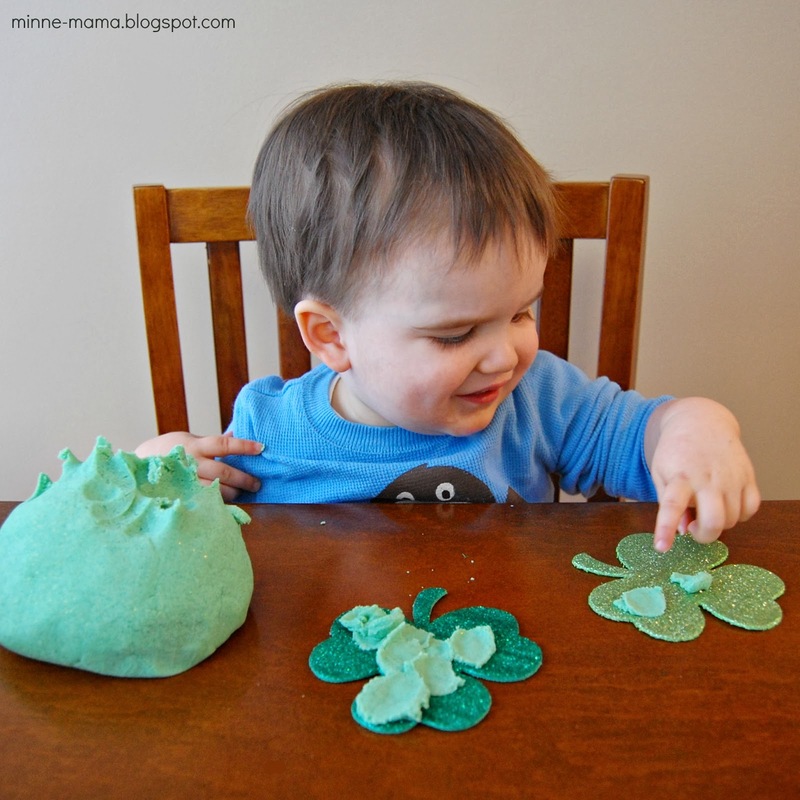 We have been playing with our Valentine play dough A TON since we made it (I think even the day before we made this one! 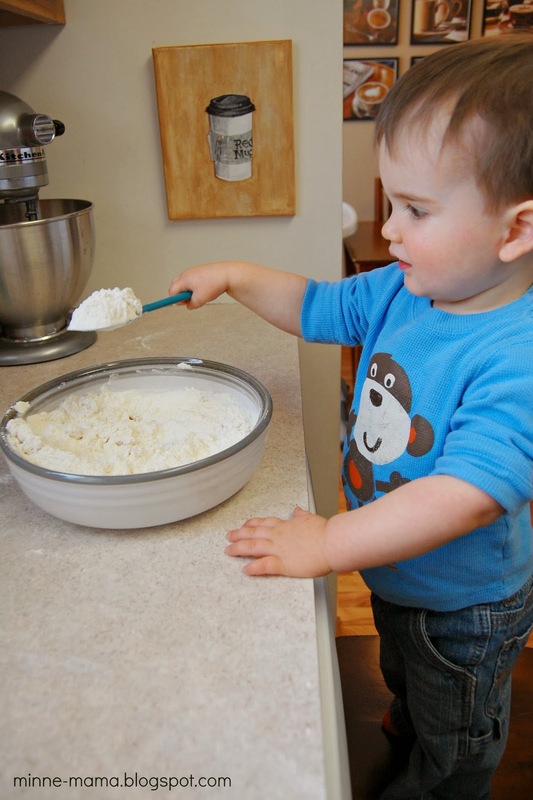 ), so it was time to make up an exciting new batch! 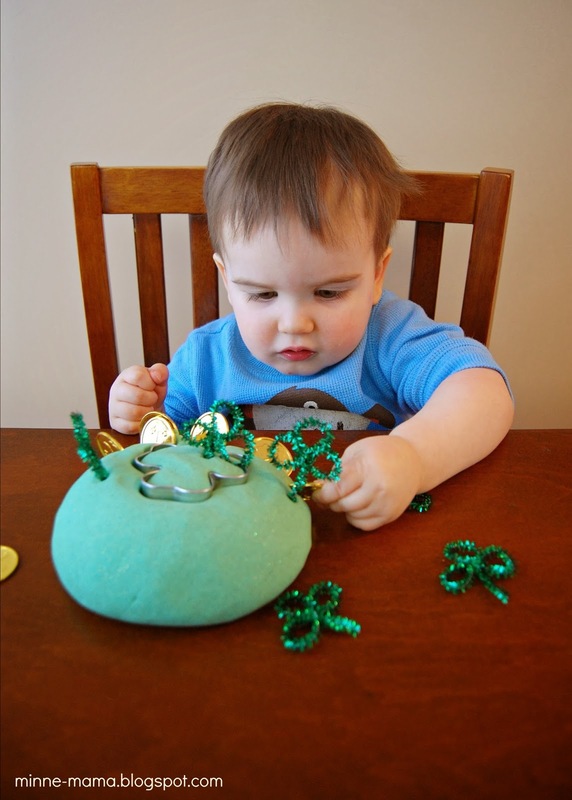 This time, with St. Patrick's Day right around the corner, we went with bright green and sparkly, with a lot of fun ways to play! 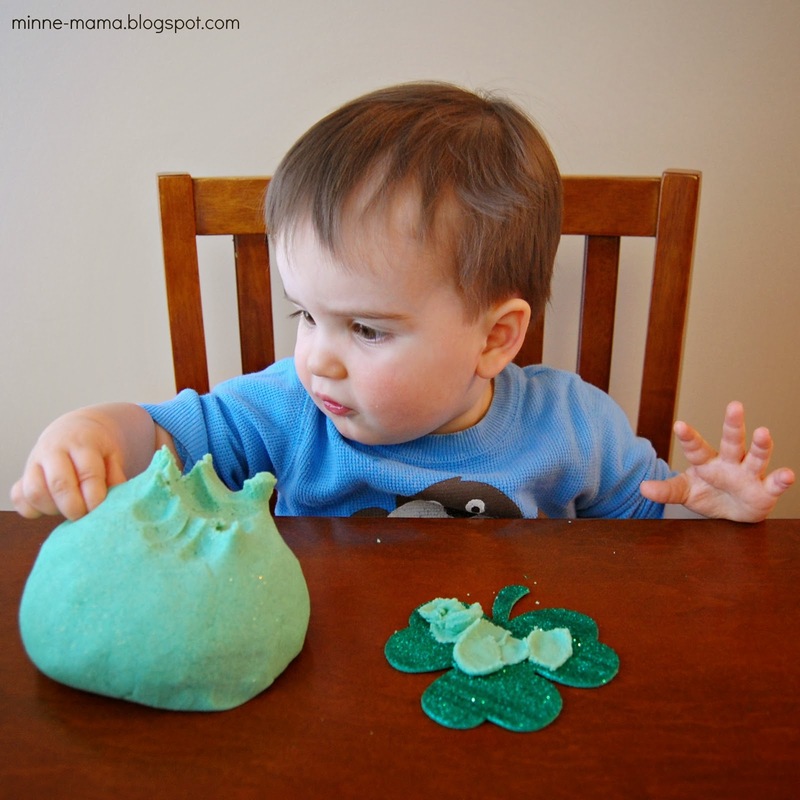 These are our play dough accessories. 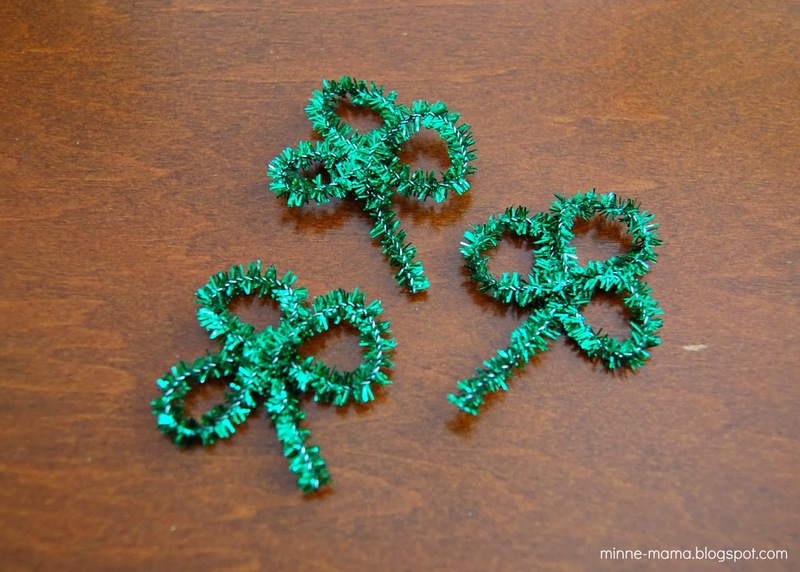 With our green pipe cleaners, I made some small shamrocks for Skyler to stick into his play dough. 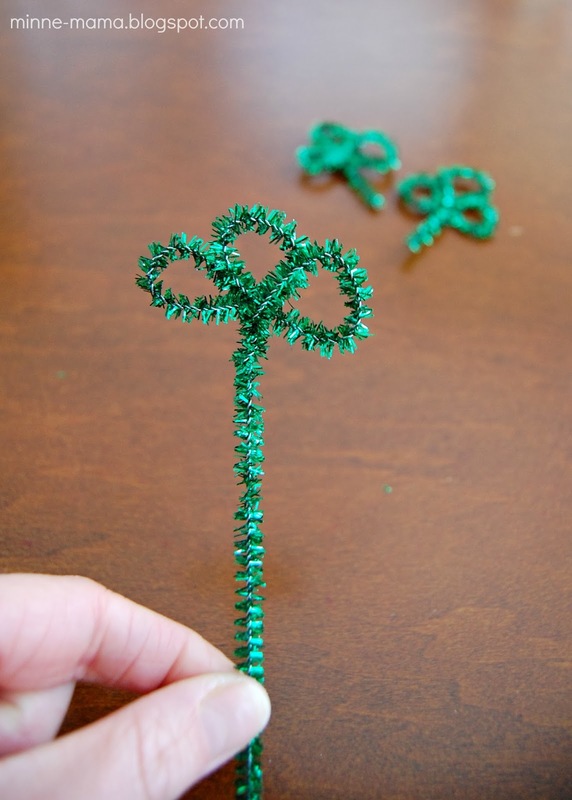 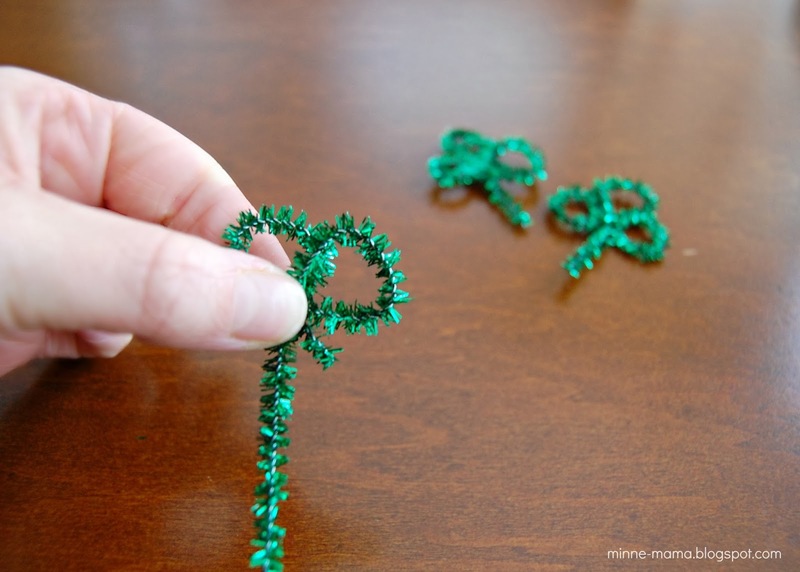 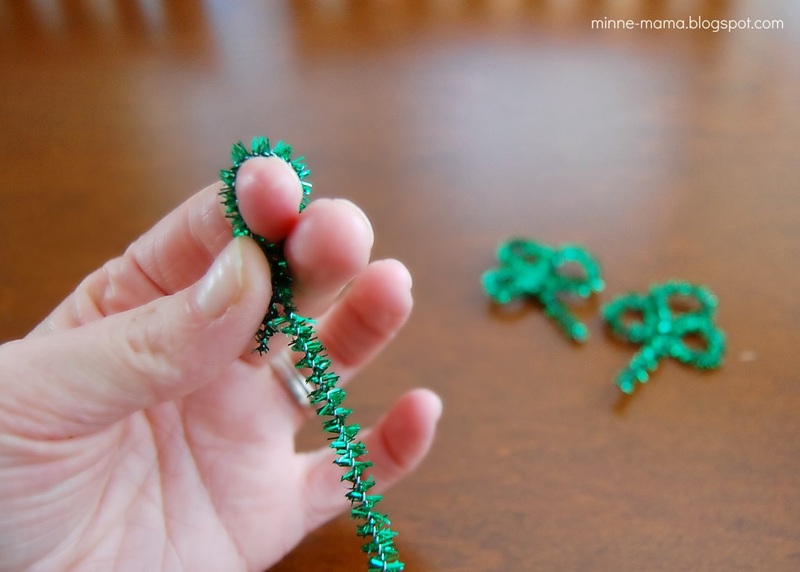 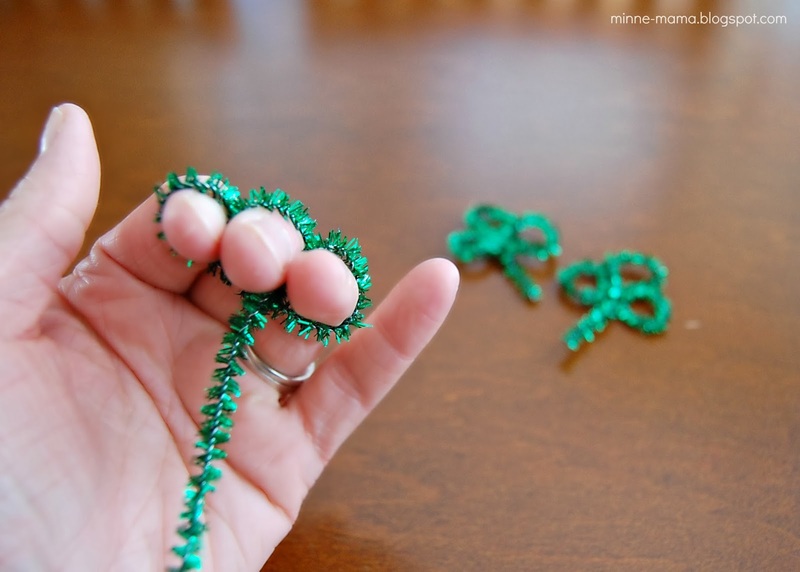 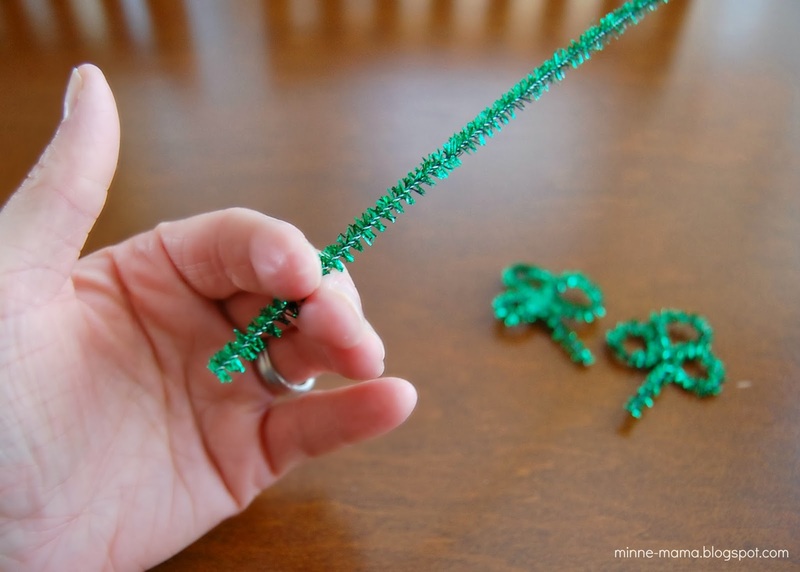 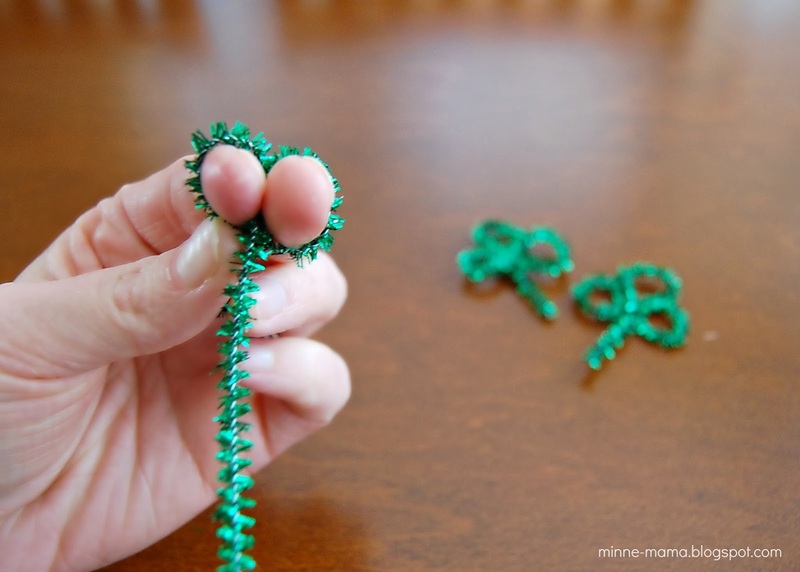 They are super simple to make - just twist the pipe cleaner around three fingers, twist the two ends together underneath the loops, and then cut the stem to the needed length! 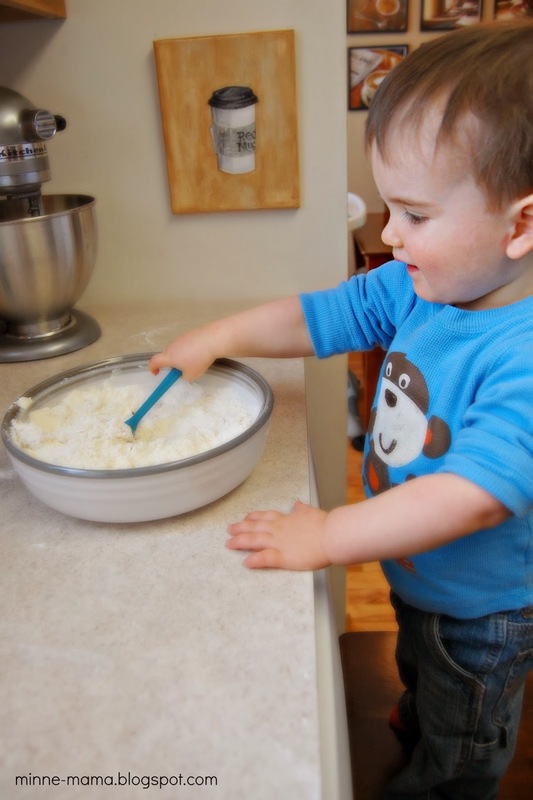 Similar to our last batch of play dough (following the same recipe we used last time, from The Imagination Tree), I measured everything out ahead of time and then Skyler dumped everything into the bowl and mixed it up. 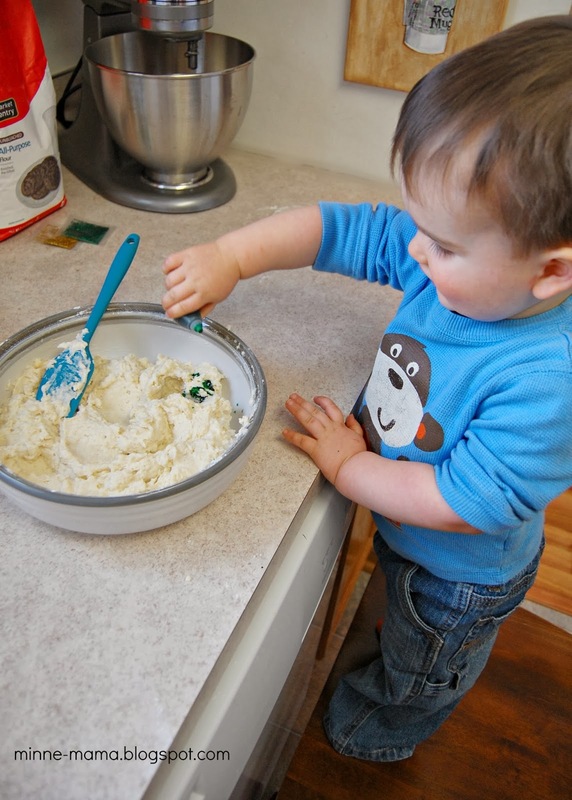 He also added our food coloring, and a lot of it at that ;) As you can see from his big smile, he loved squeezing food coloring! 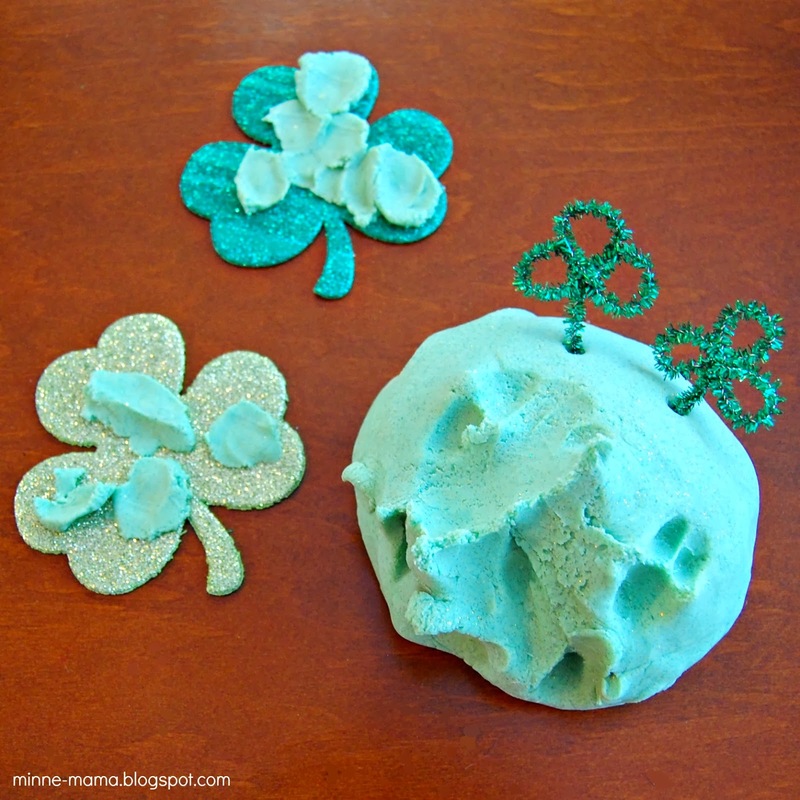 We added green and gold glitter to our play dough before kneading it and we were ready to play! 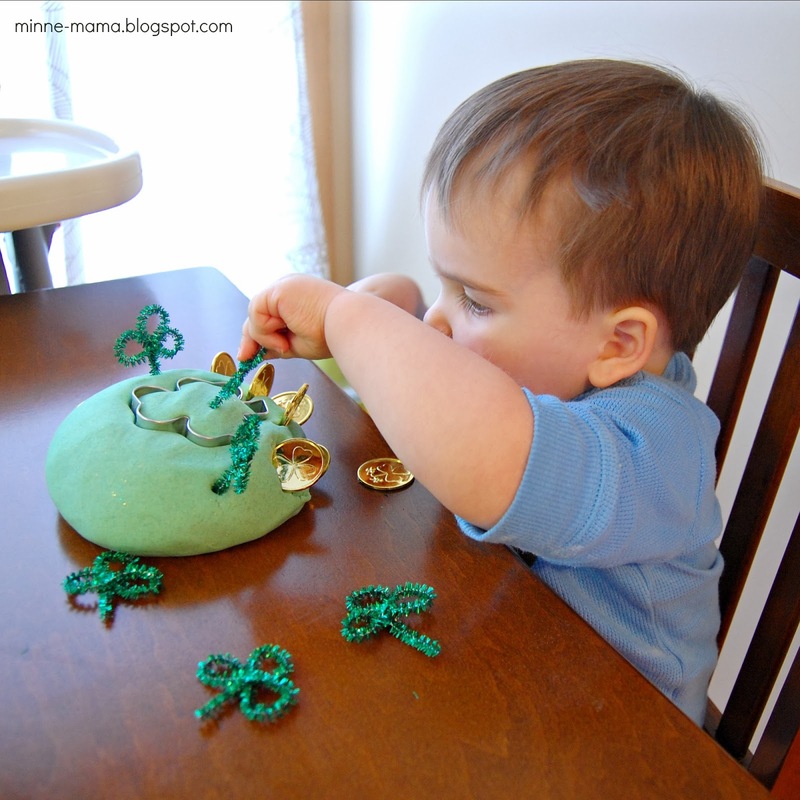 Skyler quickly pressed his cookie cutter into the middle of the play dough ball and then decorated all around it with the pipe cleaner shamrocks and gold coins. 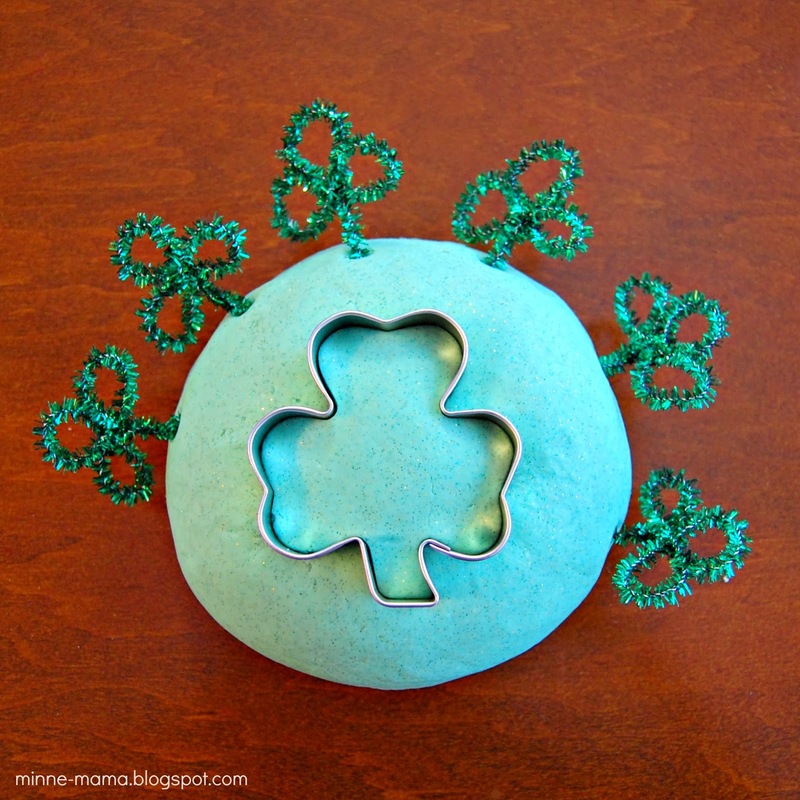 Putting the coins through the cookie cutter was so fun! 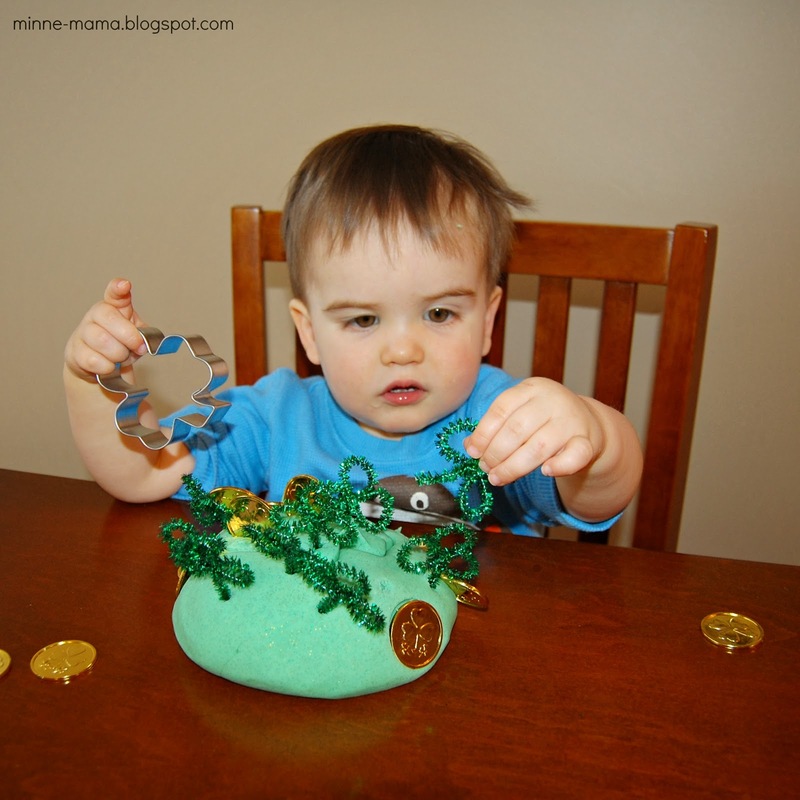 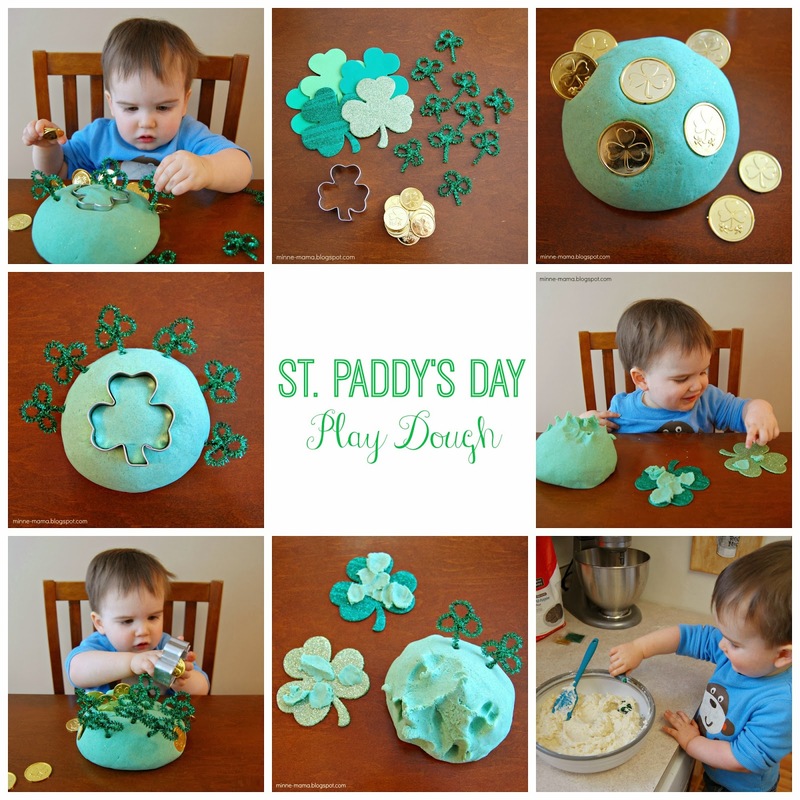 After Skyler had thoroughly filled the play dough with shamrocks and coins, we rolled it into a fresh ball and tried something new. 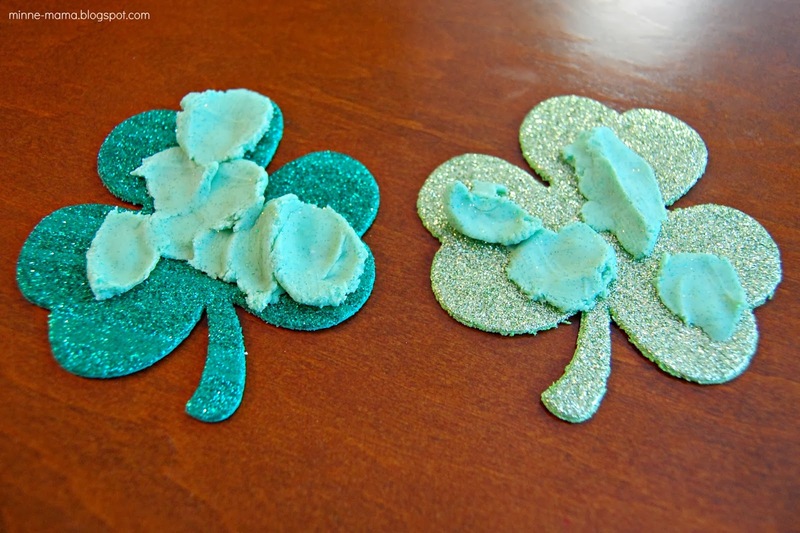 With the big glittery foam shamrocks, I thought it would be fun to teach Skyler how to pinch off small pieces and stick them to the shamrock to fill it in. 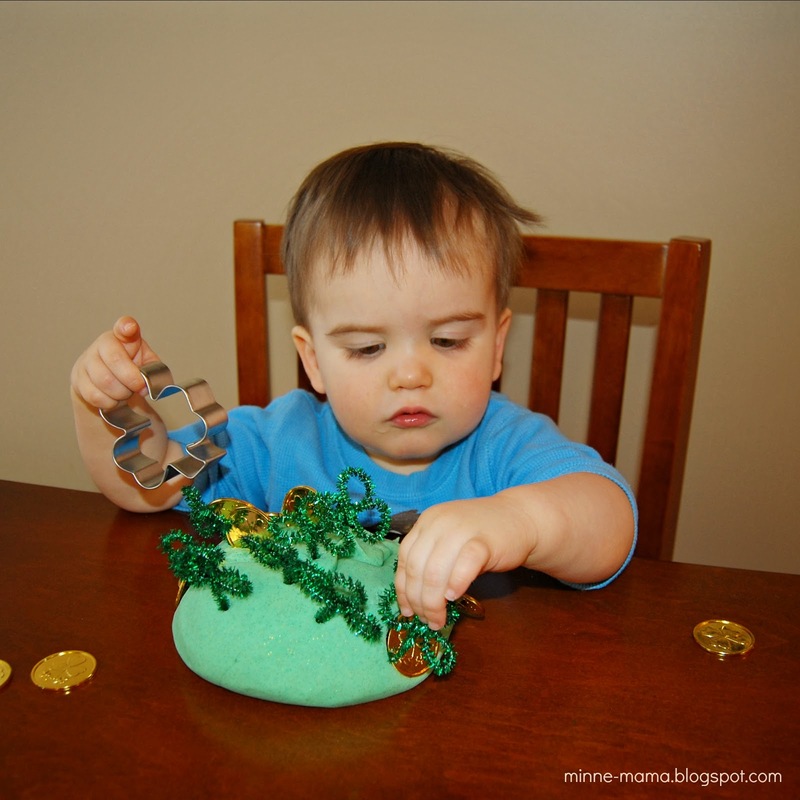 Great fine motor skills with the pinching and pressing! 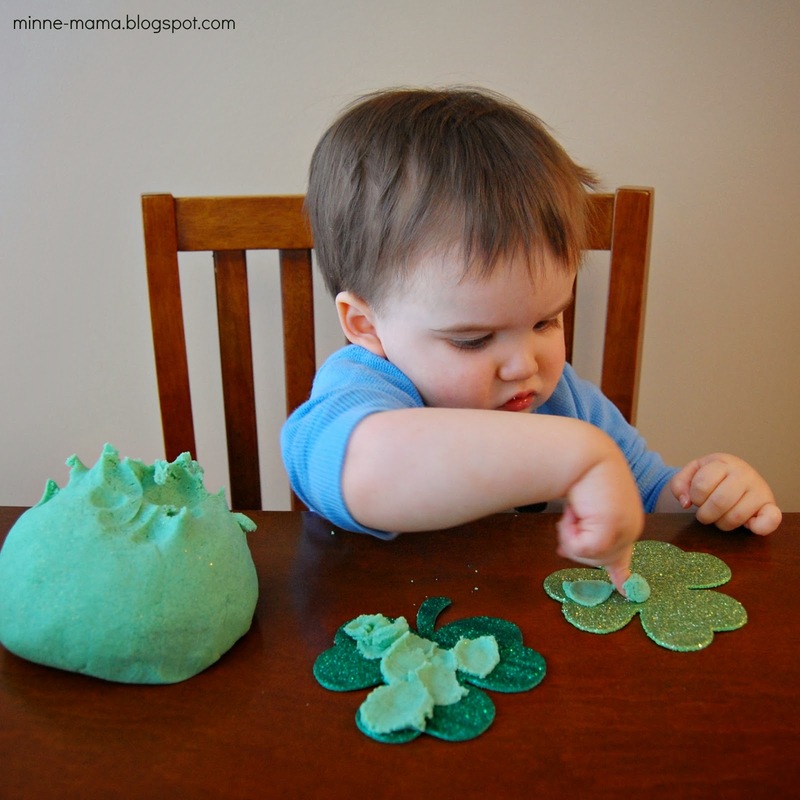 This method of play with our glittery green dough was so fun! 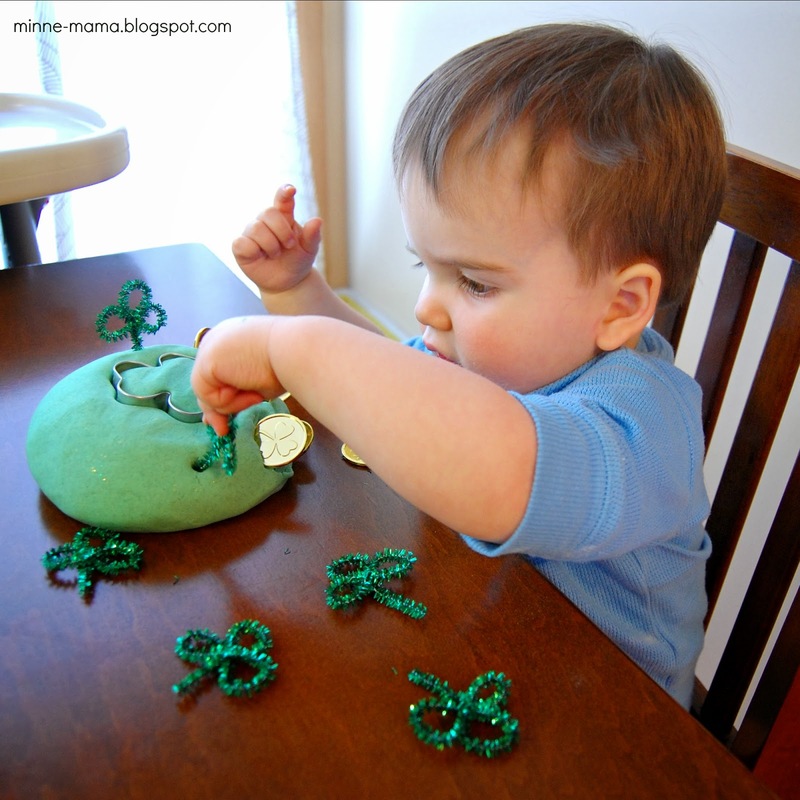 Skyler spent a lot of time carefully pinching off small amounts and pressing them down, filling in his shamrocks bit by bit! 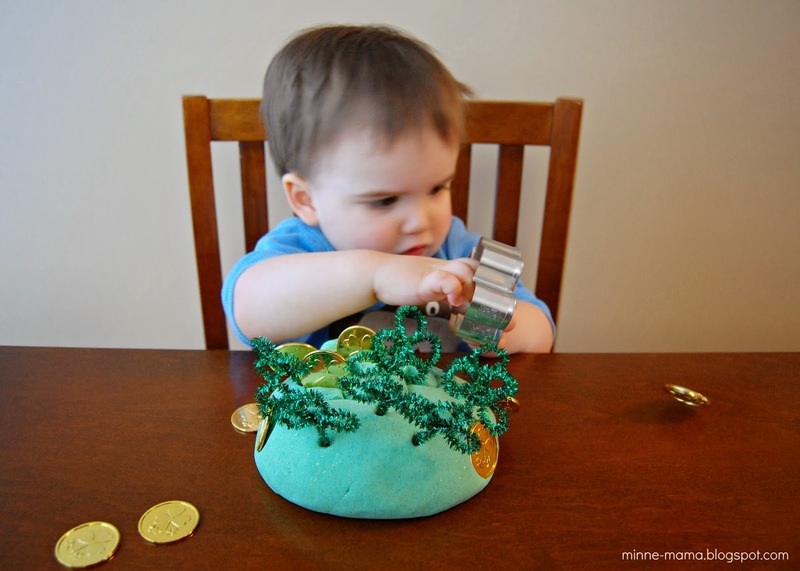 If he pinched off a big piece, he would put it back and get a smaller amount between his fingers. 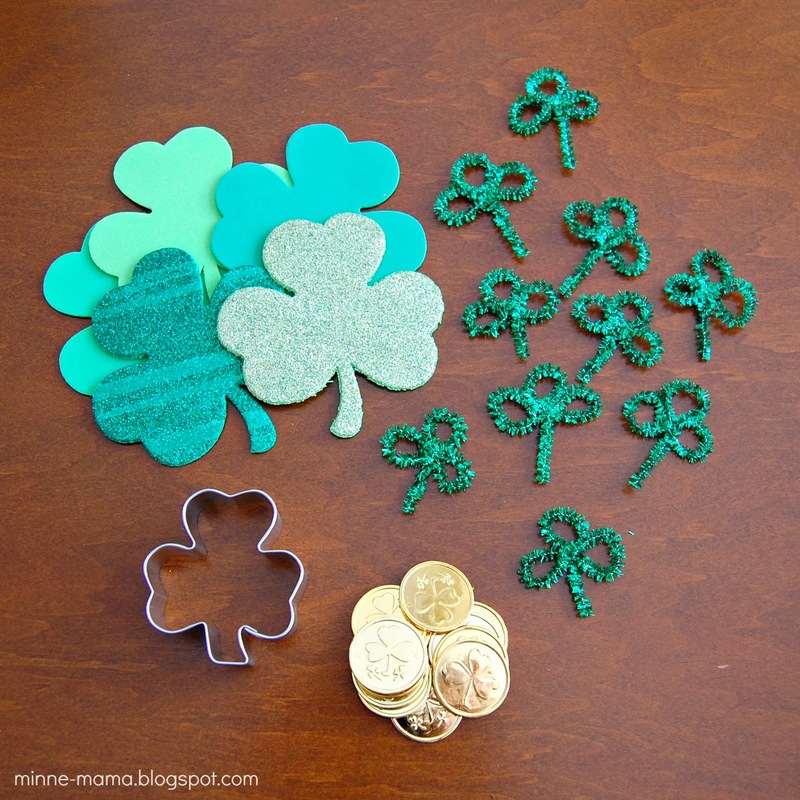 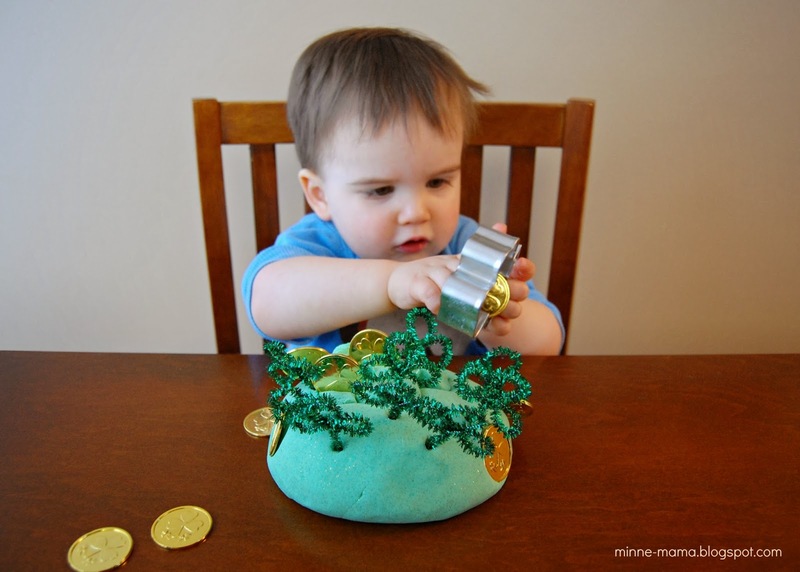 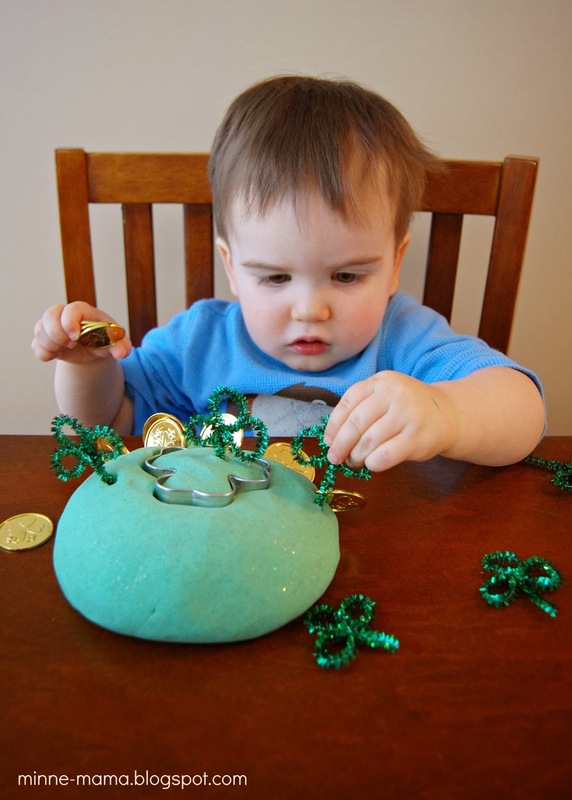 So far, we have done three ways of play with the pinch and press method, pushing in the pipe cleaners and cookie cutter to create a little field of shamrocks, and burying and finding the gold coins. 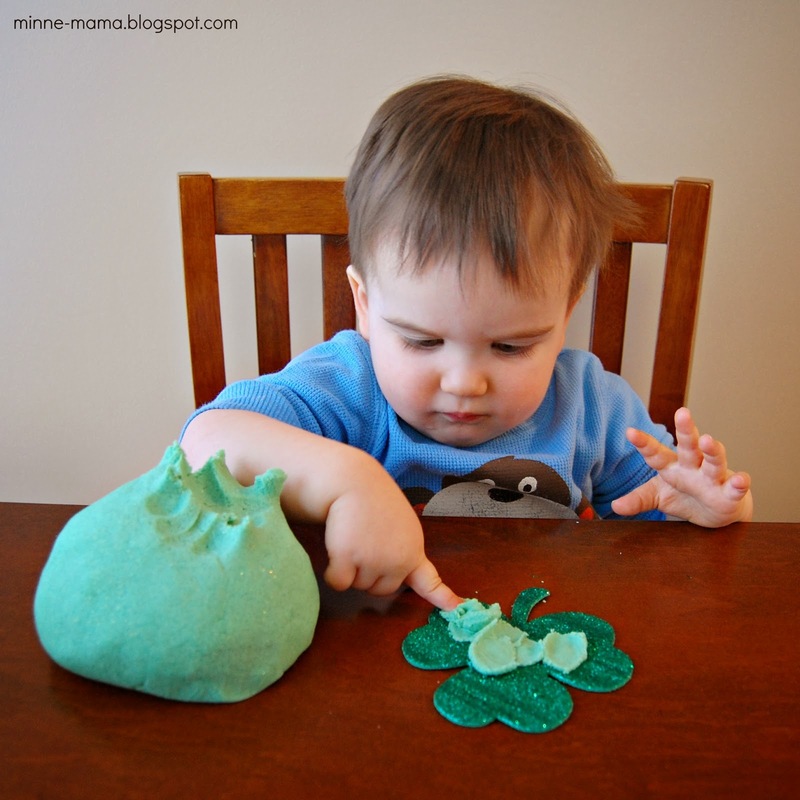 I think this play dough has been even more popular with my little one! 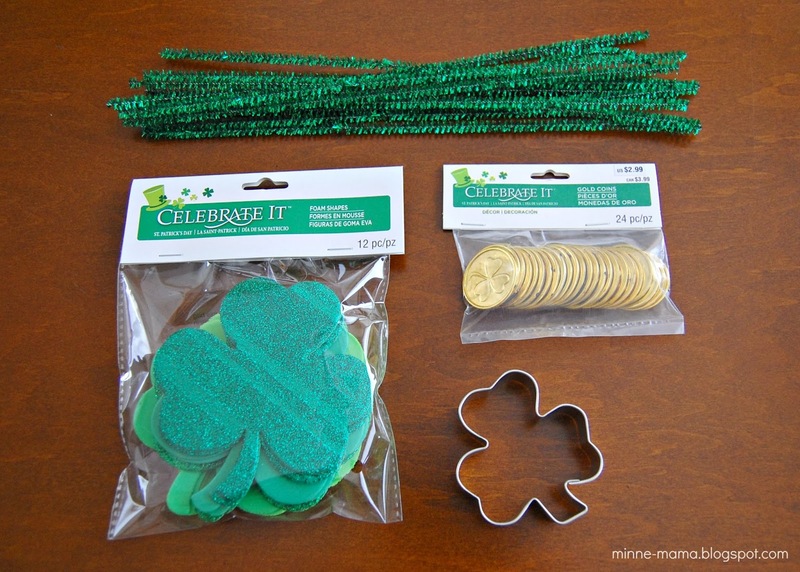 This will last us well past St. Patrick's Day! 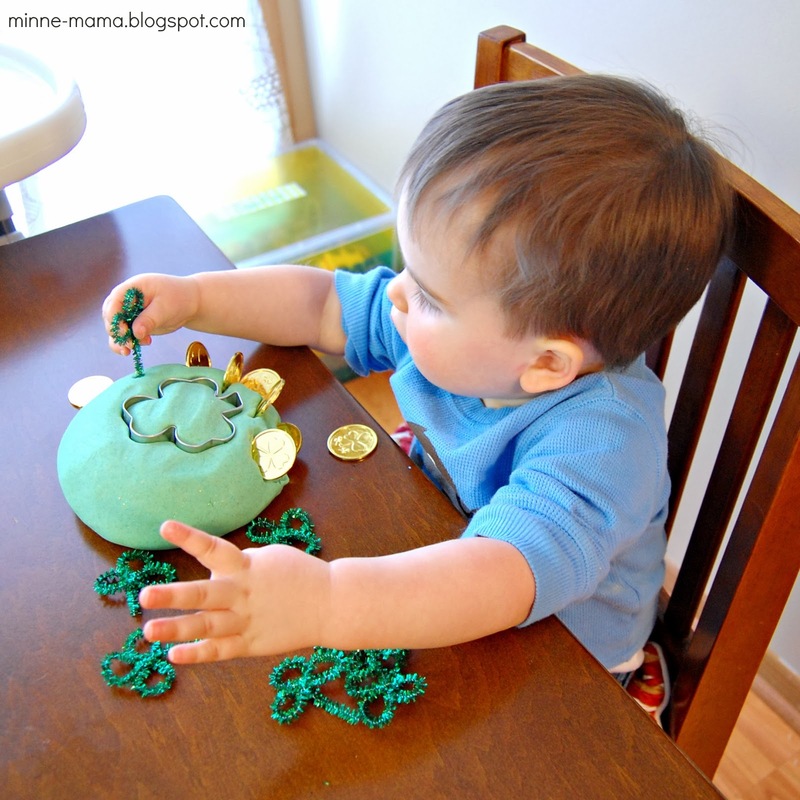 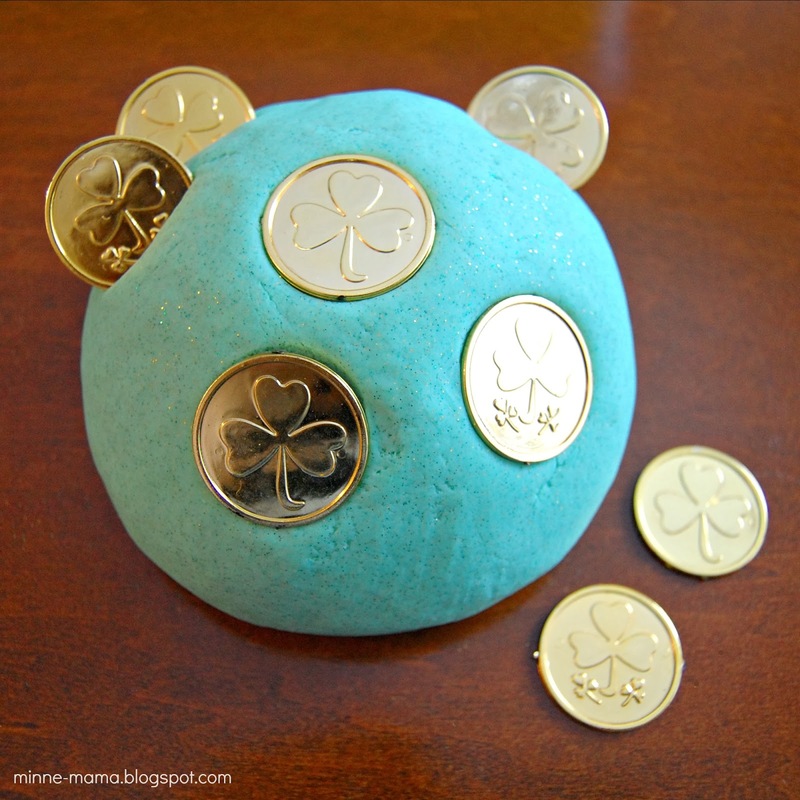 the shamrock shape stay on the play dough after lifting the coins!